Read Wright's quote above again! Wright is talking about the doctrine of Justification and his quote has nothing to do directly with homosexuality but for some reason when I first read this quote in his book Justification I could not help but think of all the conversations I have had with people where I was trying to at least show them that the texts which may have to do with homosexuality are not as simple as we might have thought but they kept going back to the same texts and pointing them out like they should be obvious as though they hadn't listened to me at all, saying things like "well it says it right there." In those conversations of which I have had numerous I tend to feel like banging my head against a wall. But what Wright says about justification is true of homosexuality. What we think of as a "natural" reading may in fact be totally un-natural to Paul and other Biblical authors. Our context has provided us with certain definitions of "homosexuality" which may in fact be very different from those definitions provided by a 1st century context like that of Paul. And in the homosexuality debate, comfort may have more to do with our reading than we know. For example, if I were gay I would be quite uncomfortable with Paul listing my persuasion among idolaters, adulterers, and male prostitutes so I may go seeking an easier more comfortable reading and context for definition which may be very different from that of Paul in 1 Corinthians 6:9. On the other hand, if I were homophobic I would be very uncomfortable with the idea that Paul could be talking about anything other than the sort of homosexuality I see around me today so I might subconsciously be doing everything I can to continue to ignore any alternative suggestions and in doing so I may be projecting my homophobia onto Paul when Paul himself may indeed be talking about something very different from the homosexuality I am used to seeing. What we need to do is not necessarily liberate ourselves from the confinement of our own definitions and contexts (for that may be impossible) but we do need to recognize that our definitions and contexts may be different from Paul's and we need to try to read his writings as best we can, asking "what did Paul mean when he wrote this?" and trying to understand the text from his perspective rather than only our own even if this ends up being uncomfortable. 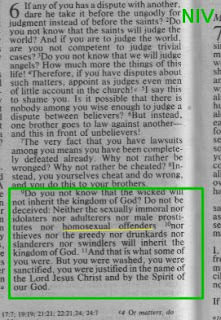 So, for example, when Paul writes "the men also abandoned natural relations with women and were inflamed with lust for one another. Men committed indecent acts with other men, and received in themselves the due penalty for their perversion." We need to get beyond the "natural" reading of our context which says "duh, he's saying homosexuality as a whole is a perversion and therefore gay marriage is a sin" and perhaps ask if Paul might be talking about pagan worship rituals or some kind of temple prostitution which may have fit his context better than the Gay Pride Parade or gay marriage. We may owe our understanding to culture and context more so than to Paul and the Holy Spirit.